It’s good to be Richard Linklater. How many other American film directors can you name who’ve had three feature-length documentaries made about them, before they’ve reached the age of 60? One of the docs is “Double Play” and it’s kind of a, well, double play: the critic and filmmaker Gabe Klinger’s 2013 picture chronicles the friendship between Linklater and avant-garde filmmaker James Benning. 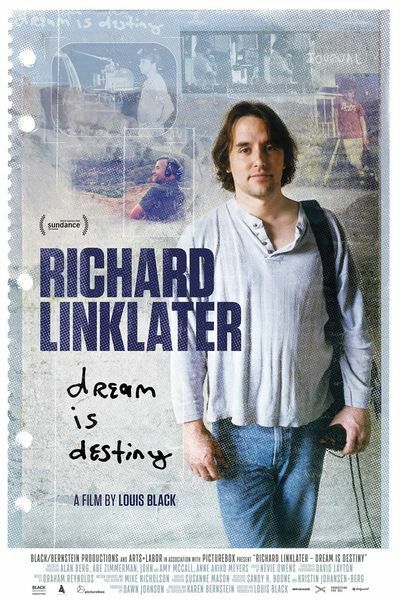 I haven’t seen 2014’s “21 Years: Richard Linklater.” But this year brings “Richard Linklater: Dream Is Destiny,” co-directed by Karen Bernstein and Louis Black. Not the comedian Louis Black; this Black was the founder of the alt-newspaper the Austin Chronicle, one of the founders of the SXSW Film Festival and an active champion of filmmaking in the region (this year he brought a restoration of Eagle Penell’s “Last Night At the Alamo” to BAM Cinemafest). He also acted in Linklater’s early feature “Slacker” and is seen interviewing Linklater throughout this movie. His presence is properly indicative of the film’s treatment of Linklater as both a Hollywood outsider and a regional filmmaker par excellence. But he does so in order to make art, not to make a financial fortune, and the movie does a good job of showing how the filmmaker has maintained his independence, keeping Hollywood at arm’s length while never approaching it with disdain. The movie’s strongest patch is early on, chronicling the creation of “Slacker” and its attendant micro-success. Seeing John Pierson interviewed brings the early ‘90s optimism about American indie films back in a heady rush, as does seeing the clip of our own founder Roger Ebert talking about the movie. I’d have liked to hear more about the “dumping” of “Dazed and Confused” by distributor Universal, and Linklater’s reflections on how the movie subsequently became a cult item anyway. One sequence depicting a fallow period for Linklater in terms of critical reception features a dopey audio montage that attempts to float Linklater upon a sea of bad-review-troubles; I would have preferred, again, to hear from Linklater himself about the failed narrative experiment of “Fast Food Nation.” (Kent Jones also bemoans the reception of the masterpiece “A Scanner Darkly” in 2006; don’t look at me, my friend, I gave it four stars in Premiere.) The stuff dealing with 2014’s “Boyhood” does remind one just what an extraordinary accomplishment that movie is. And again, it is an occasion to celebrate the filmmaker’s “Git-R-Done” ethos: To entertain “the idea that there was fear he wasn’t gonna finish ‘Boyhood’,” Ethan Hawke says, “was to fundamentally misunderstand him.” While not an earth-shaker, this movie is an amiable and informative look at a guy who is shaping up to be, yes, one of the major American directors of the last fifty years.